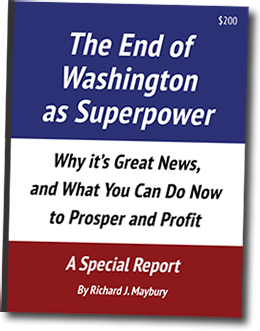 In 1990, while the rest of the world was cheering the "new era of peace" after the collapse of the Soviet Empire, Richard Maybury wrote The Coming Soviet Civil War — How You Can Profit. This highly unorthodox 91-page report explained the Soviet Empire, it's coming battles, and investments that would benefit from them. As you can imagine, those who followed Mr. Maybury's advice earned breathtaking profits. Now Mr. Maybury says, "history is repeating." He believes the fall of Washington's empire "is producing a similar chaotic transition period that is having a profound impact on your investments." In his new 140-page special report, he explains the crisis, and gives 34 investments he expects to profit from it, including his top 5 . Receive highly insightful special report for only $89, saving you 56% off the $200 cover price when you order today. New opportunities from the breakup of Washington's empire. Find out how this map is affecting your investments. "...This has happened before. Look at the three other chief empires of the 20th century, the British, French and Russian. All three countries are much better places to live now than when they had empires, and America will be, too." But the temporary transition period of wars, and economic and financial chaos, presents investors with a stark choice. They can invest in (1) things that do well during this chaos or (2) the many that don't. Order now to receive this carefully selected collection of Mr. Maybury's most revealing Early Warning Report articles about the crisis, and the steps you can take to protect yourself and your family.